Owing to the immense experience and a competent team of experts, we are able to offer Industrial Fire Hose Reels to respectable clients. These fire hose reels offered by us are made utilizing high grade M.S. thick plate, non-corrosive metal complete with G.M. valve and chromium plated shut-off nozzle at trustworthy vendors' premises. In addition to this, the offered range is available with control nozzles fixed at the tip of the hose that aids operator in handling the flow and direction of water. 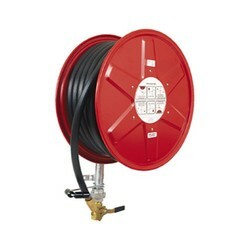 In order to cater to the diverse requirements of honorable clients, we are able to offer Automatic Fire Hose Reels. The offered range of hose reels is made by authentic vendors, who ensure to bring it in strict compliance with the IS: 884. swinging (vertical) type standards. Along with this, the offered range of hose reels is available with a nozzle attached at the end. These products are known for handling the he flow of water.